This is a three-day self-inquiry practice from Amy Weintraub that allows you to clear your inner space of whatever is limiting your clear seeing. Close your eyes and imagine yourself as a small child, perhaps seven or eight. As though looking at a picture in a photo album, see yourself doing something you loved, something that fully absorbed your body, mind and spirit. Now turn the pages of your photo album until you find a picture of yourself at seventeen or eighteen. What were you doing at seventeen or eighteen that fully absorbed your body, mind and spirit? See yourself doing that now. Continue turning the pages of your photo album through each decade in your life, stopping at pictures of yourself doing something that brought you great joy. Finally, stop at a picture of yourself in the recent past. See yourself doing something you love, something that absorbs you completely. Now take ten minutes to write about the images that came to you in this visualization. What are you doing when you are the happiest? What are my true gifts? Close your eyes and imagine yourself as a small child, perhaps seven or eight. As though looking at a picture in a photo album, see yourself doing something that made someone you cared about feel good about herself or himself and that also made you feel good about yourself. As on Day One, go through your photo album, stopping at a picture of yourself in each decade where you are doing something that not only serves yourself but also serves another. Finally, stop at a picture of yourself in the recent past. See yourself doing well at something that you appreciate. Perhaps there is another being in the picture appreciating you too. Now take ten minutes to write about the images that came to you in this visualization. What are your true gifts? How does what I am doing when I am the happiest align with my true gifts? Think about where the images from each of these exercises merge. See those pictures throughout your life. Now take ten minutes to write about the images that arise. How do my true gifts inform what I am doing when I’m the happiest? Let this question inform your dharma. Write about how your life choices are aligning with your joy and your gifts and how they are not. Explore in your writing how you night fully merge the paths of happiness in your life with the path of your highest abilities, your truest gifts. Blessings on fulfilling your dharma. This practice has been excerpted from Amy Weintraub’s chapter “Yoga in Mental Health Treatment: The Crumbling Wall” in Yoga Therapy: Theory and Practice, edited by Ellen G. Horovitz & Staffan Elgelid. Amy Weintraub, MFA, E-RYT 500, founding director of the LifeForce Yoga Healing Institute, the author of Yoga for Depression (Broadway Books, 2004) and Yoga Skills for Therapists: Effective Practices for Mood Management (W.W. Norton, 2012), has been a pioneer in the field of yoga and mental health for over twenty years. 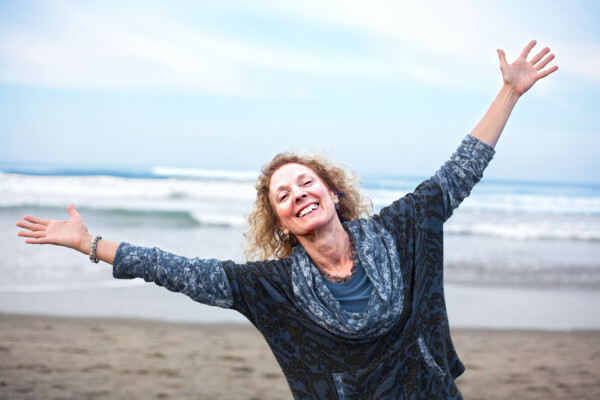 She offers the LifeForce Yoga Practitioner Training for Depression and Anxiety to health and yoga professionals and offers workshops for every day practitioners. Amy leads workshops and professional trainings at academic and psychology conferences internationally at such venues as the Boston University Graduate School of Psychology, the University of Arizona Medical School, the Psychotherapy Networker Symposium, the Integrative Mental Health Conference, the Cape Cod Institute, Kripalu Center, Omega Institute, Sivananda Ashram, Yogaville, Esalen, Patanjali University in Haridwar, India and Yoga studios throughout the United States. Amy is also a regular contributer on the Goddesses in America blog. Connect with Amy and learn more about her upcoming offerings at www.yogafordepression.com.